Ryan Poskitt, who went close to scoring for Glasshoughton Welfare against Armthorpe. 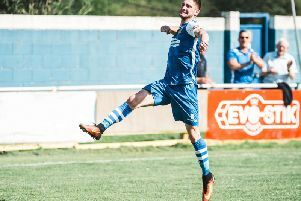 Glasshoughton Welfare were looking to climb the Toolstation NCE Division One table when they were at home to Armthorpe Welfare on Tuesday night, but suffered a 2-0 defeat. They started well enough when early on Lewis Akeister was denied by the visiting keeper and Andy Horbury screwed a shot wide. Welfare were made to pay on 38 minutes when a Gary Gowen cross shot got to the far post and bounced in. In the second period Ryan Poskitt was unlucky when his goal bound effort was cleared off the line, but the game was put to bed 10 minutes from time as Gary Collier drove home. Glasshoughton put up a good show at third-placed Campion on Saturday and came away from the Bradford-based side with a valuable point courtesy of Conor Glavin’s second half strike. They started the game the stronger of the two sides, moving the ball round the pitch well. Horbury had another excellent game, being a handful for the Campion defence throughout. Glavin and Poskitt both went close in the first half when Campion’s attack was kept to long distance shots. As the half drew to a close Glasshoughton were caught in possession on the right, however, and full-back Danny Stocker ran unchallenged into the box to hit a good finish with his left foot past outstretched keeper Arran Murphy. Welfare started the second half well, playing some good football. Glavin was a constant threat around the box and got his reward on 64 minutes with a fantastic finish from a Horbury cross. Horbury thought he had hit the winner after racing clear only to see the ball just drift past the far post. After the game Welfare joint manager Darren Holmes said: “It was good game with both teams having chances, but we feel that we could have taken all points with a bit more composure in the last third. Glasshoughton’s busy period continues as they host AFC Darwen in the second qualifying round of the FA Vase this Saturday (kick-off 3pm) and make the short travel to play Nostell MW in the league next Wednesday (7.45pm).